We are now living in a world full of wireless invention and devices. We are enjoying wireless communication or transmission of information without cords, cables, or electrical wires. The communication and information is transmitted through the air by using electromagnetic waves e.g. radio frequencies, satellite, etc. in a wireless communication technology network. Today, we have many varieties of devices and technologies such as computers, laptops, taps, smart phones, printers, mouse, Bluetooth, etc. The wireless communication technology has made it possible for users to communicate even from anywhere in the world with the use of devices such as cordless telephones, mobile phones, GPS devices, wireless computer parts, satellite television, and etc. Some of us may not get used to the many cordless devices but many of us are finding it so convenient using cordless devices without the hassle of trying to untangle the bunch of wires or cables. Until recently, we have been charging our mobile phones with a wired connection which we plugged into a power supply socket. Not every wired connection can be used by any mobile phone. Take for example, a charger connection for an iPhone device cannot be used by an android phone and likewise, a common charger connection cannot be used by an iPhone. So every time you are packing for a trip away from home, you have to remember to take along your own charger connection in order to be able to charge your phone. There is now a wide selection of wireless charging devices available online and some of the TYLT wireless chargers includes those for home, office, or car use. These wireless chargers are compatible with any devices equipped with the Qi technology. With these wireless chargers, users can place their mobile devices in any position to receive the charge. Some of these wireless chargers are fitted with anti-slip surfaces or suction base for extra stability and security. Users need not have to remove the protective case from your mobile devices for charging purposes. For car use, the charger can be mounted on the dashboard or windscreen for easy and convenient access. There is another specially designed bags with chargers model. These backpacks are able to provide a full charge to your mobile phone, tablet, and also your type-C laptop at high speed. 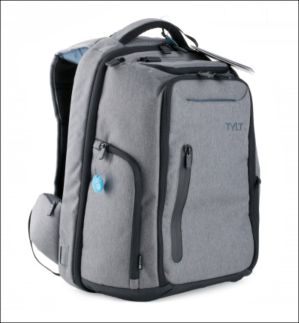 The backpack is made from high quality materials to last and strong enough to hold a 15” laptop, and etc. There are internal pockets to provide enough storage partitions to hold all your other devices.